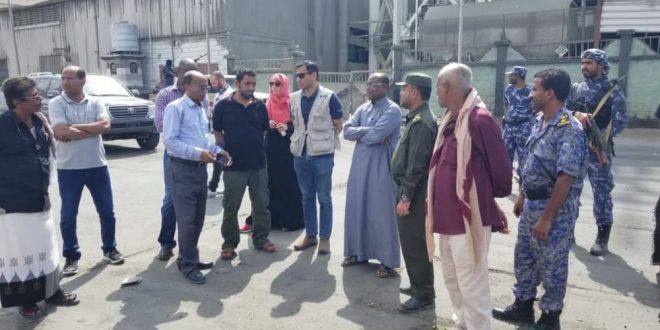 The General Directorate of Security and Police on the coast of Hadramout, General Munir Karama Al-Tamimi, received a delegation from the United Nations upon his arrival in the city of Mukalla to see the security and humanitarian situation in the governorate. During the reception, Brigadier Tamimi welcomed the visiting delegation of the city of Mukalla and conveyed to them the greetings of the Governor of Hadramout, Commander of the Second Military Region, Maj. Gen. Faraj Salemin Al-Bahssani, who is currently in Sayoun city, stressing the importance of this visit to the UN delegation in recognizing the needs of the governorate in the humanitarian and service aspects. Brigadier Tamimi briefed the delegation on the security situation in Mukalla and the great stability situation witnessed by all the provinces of Hadramout coast after the great security successes achieved after liberation from the control of al-Qaeda terrorist organization thanks to the great efforts to lead the local authority in the governorate and the security and military services and support from the brothers in the Arab coalition. The delegation, together with the Director General of Security and Police Brigadier Munir Tamimi, visited the port of Mukalla where they were received by Salem Bassemir, Chairman of the Board of Directors of the Arab Sea Ports Organization, to learn about the port’s security reserves, technical and operational capabilities and readiness to receive humanitarian assistance. The UN delegation also visited the refugee camp to identify their needs and humanitarian situation in order to provide the necessary assistance needed by the displaced.